Peter Jackson’s thirteen year crusade into Middle Earth – traversing two trilogies and six films – draws to a feeble, unfit end with The Hobbit: The Battle Of The Five Armies. Roused from his slumber, Smaug (Benedict Cumberbatch) wreaks fiery havoc upon Laketown, leaving his vast wealth undefended. Bilbo (Martin Freeman), Thorin (Richard Armitage) and his company of dwarves stake their claim, unaware of the opposing forces descending upon The Lonely Mountain. 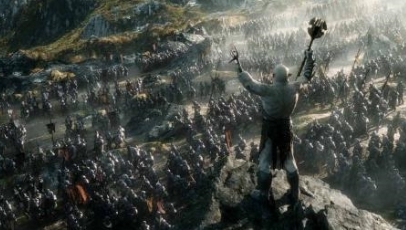 Bloated beyond comprehension, The Battle Of The Five Armies is the most tedious of Hobbit films, advocating the belief that three films is one too many for J.R.R. Tolkien’s slim source material. A full-scale war exhausts most of the run time, which leaves scant room for character development (Bilbo is almost entirely discarded, while everyone else is inconsequential) or intensity. Instead, what Jackson and his co-writers provide – aside from the ferocious pre-titles sequence that should have been part of The Desolation Of Smaug – is monotonous pre-amble to a final battle that underwhelms with its amateurish CGI and depth. It’s a disappointing and above all else dull closing curtain to a trilogy that’s never been able to escape the shadows of the superior Lord Of The Rings.